Do you wish to have an iPhone however it is too pricey for you? 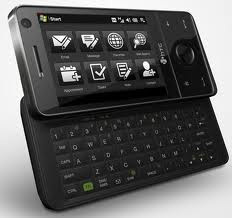 then checkout HTC FUZE Smartphone, this is a great alternative to iPhone. HTC FUZE Smartphone has many features that are not found on the iPhone. This phone delivers good performance and a functional design. It's a ‘hybrid’ touchscreen phone because it has touchscreen and a slide keyboard. The touchscreen integrates the graphic rich TouchFlo 3D technology. It responds perfectly to finger gestures and can be accessed easily by a single hand. HTC FUZE Smartphone also has in and out zoom, great for viewing the web using their Opera browser. It runs on the Windows Mobile 6.1 platform. Its battery has nearly 500 hours (19days) standby duration and over 7.4 hours of talk time. Built with a 3.2 megapixel camera, it can take images, record videos and can also be used for video conferencing. HTC FUZE Smartphone operates on a hefty 288 MB of RAM.